The Victoria Harbour is a natural harbour separating Hong Kong Island from Kowloon. It is the one spot in the city that really makes Hong Kong different from anywhere else in the world. One of the main reasons the British were interested in settling in Hong Kong during the mid 1800s was because of the trading port available at Victoria Harbour. Since then it has become one of the biggest trading ports in Asia with more ships going through the harbour than most ports in the world. The panoramic view of the harbour from either side is something everyone who visits Hong Kong should see for themselves. From what I’ve seen, the Victoria Harbour is the most photographed place in Hong Kong. When you see it for yourself, you’ll know exactly why that is. There are a couple of underwater tunnels that go across the harbour to allow travel to either side by car and MTR. But the most impressive way to get across from one side to the other is by riding on the Star Ferry. The Star Ferry is a fleet of ferries used in Hong Kong to transport people from one side of the harbour to the other. It may take a little longer to get to where you want to go, but it’s well worth it just for the experience and the great views going from one side to the other. Locals will often take the Star Ferry to cross the harbour instead of taking other forms of public transportation. Star Ferry Piers are located at Tsim Sha Tsui, Kowloon as well as Central and Wan Chai, Hong Kong Island. You can also take a ride around the harbour on a traditional Chinese Junk named Aqua Luna. The best time to ride on the Junk is after it gets dark so you can see A Symphony of Lights during the ride. Be sure to bring your camera or camcorder for this. During Christmas time you’ll see a lot of the buildings at the waterfront are decorated with Christmas decorations. And once Christmas is over the decorations are changed to decorations for Chinese New Year. On Chinese New Year a big fireworks display can be seen from the harbour. The Victoria Harbour is the central place in Hong Kong where the most attractions and major buildings are located in the city. Go to Tsim Sha Tsui to experience the Victoria Harbour from the Kowloon side. The view from here is so spectacular. Walk along the Tsim Sha Tsui Promenade which goes along the waterfront of the harbour. You can see quite a few tourist attractions during your walk along the Tsim Sha Tsui Promenade. Tsim Sha Tsui has lots of shopping centres, tourist attractions, and museums near the waterfront. This is the perfect place to stay as there are a wide variety of hotels ranging from cheap hotels to 5 star luxury hotels for you to choose from. And with so much to do close to your hotel, you won’t have to go very far to enjoy Hong Kong. The great thing about Hong Kong Island is that almost everything is located on the northern end of the island, fairly close to the Victoria Harbour. So it won’t take you very long to get to the waterfront. Most of the buildings in A Symphony of Lights are on this side of the harbour. Some of the most famous buildings include the Bank of China Tower (which was built where Murray House used to be before it moved to Stanley), Central Plaza, and the 2 International Finance Centre Buildings (IFC Buildings). In the movie “The Dark Knight” Batman jumped off the top of the taller International Finance Centre Building. There aren’t as many tourist attractions on the Hong Kong Island side. You’ll find the Golden Bauhinia Square, Aqua Luna and the Star Ferry. 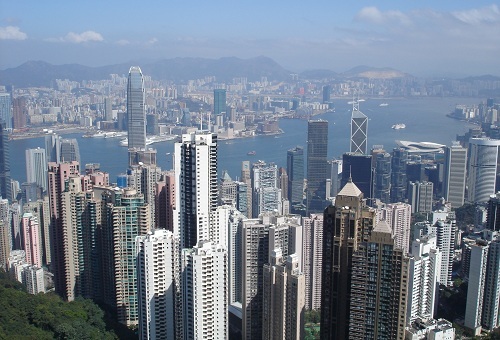 A magnificent view of Victoria Harbour can be seen from the Victoria Peak. The best spot to see this view is from the Sky Terrace 428. Other attractions nearby include the Happy Valley Racecourse and Hong Kong Park. You won’t be able to see the harbour from these attractions, but they are fairly close by. What Hong Kong Island does have a lot of is shopping. Many of the districts such as Causeway Bay, Central and Wan Chai have big shopping malls and specialty stores. I would recommend the Victoria Harbour to anyone visiting Hong Kong for any amount of time. It really is the one attraction in Hong Kong that defines this city. Most of Hong Kong seems to be built around the harbour, making it a very important place to visit.